← Robert L. Chapman, Ph.D.
East Troy, WI, September 17, 2015, Ann M. Krause-Hanson, Ph.D., Vice President of Strategic Marketing Innovation and Effectiveness at Waukesha County Technical College, has been recognized by Elite American Educators for dedication, achievements, and leadership in higher education. In her current capacity, Dr. Krause-Hanson is in charge of reporting to the university president, overseeing all programs, faculty, institutional research, and the library, and implementing work force development strategies to coordinate admission. She also retrains others for layoffs, hires within the community, manages the MSTC Foundation, markets for the school, and mentors others and facilitates processes for the Chair Academy. Dr. Krause-Hanson has been designated an academic leader and knowledgeable and headstrong mentor due to a demonstration of a passion for what she does, her students, a love of learning, and a continuous desire to keep learning. She would like to be remembered as somebody who was passionate about learning and who was here for the students. After having earned a myriad of honors and rave reviews, Dr. Krause-Hanson marks her greatest career achievement as her being awarded by her students because of her kindness and community service. Dr. Krause-Hanson was originally selected for inclusion in EliteAMERICAN Educators in in 2013. 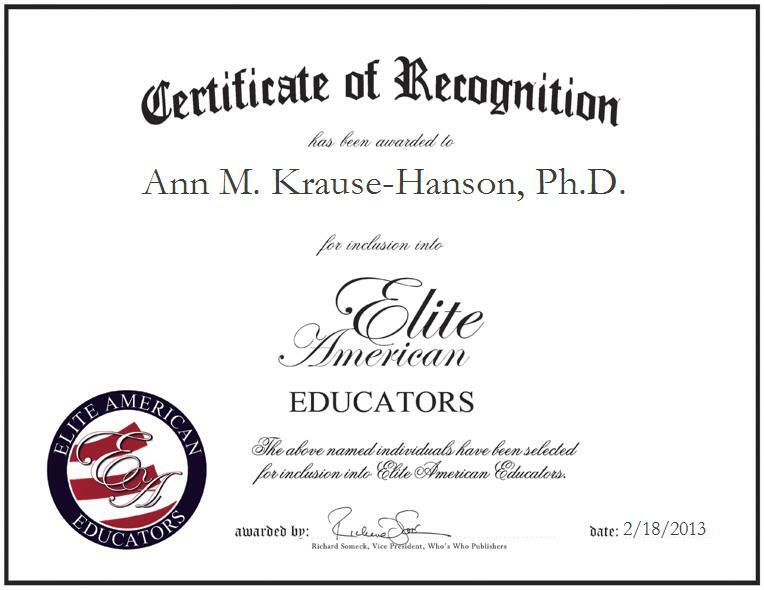 We are proud to be featuring Dr. Krause-Hanson again in EliteAMERICAN Educators for 2015. Contact Ann M. Krause-Hanson, Ph.D. This entry was posted in Academic Affairs and tagged administration, college marketing department, grant writing, grants, leadership, mentorship, recruiting. Bookmark the permalink.